Emmett was born in Pomeroy County Tyrone in Ireland. He immigrated to the United States in 1985, and met his beautiful wife Moira when living in the Bronx, and have four beautiful children, Moira Jr, Emmett Jr. Shanagh and Seamus. Emmett and Moira moved to Pearl River in 1995; where they still reside today. Emmett became very active in the local Community straight away. Emmett comes from a large family. His siblings Mary, Kevin, Annette, and Gerard all live in Tyrone while Sean & Noel and their families live in New York. Seamus [RIP] had moved to New York in 1986 for almost one year where he worked for Local 33. He moved back home in 1987 and was killed while on active duty on 7th July 1988. Emmett worked in construction and eventually started his own construction company in 1990. In 2004 Emmett opened a restaurant in Poughkeepsie, NY. The restaurant is called Emmett Mahoney’s Irish Pub & Restaurant. Emmet joined the Rockland GAA in 1996, as a player and won a few Championships. In 1999, he became a coach and has traveled with Rockland’s underage team to Ireland, and also was New York Feile coach when they won Feile. In 1999, Emmett joined together with 23 other families to help secure the funds to purchase Rockland GAA fields. They have since completed a major renovation to these fields and the Club House located at the fields. Emmett is currently the development officer for New York GAA. 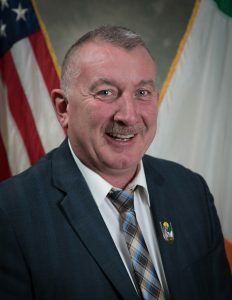 Emmett joined AOH Division 5, as well as the Rockland Irish American Cultural Center in Blauvelt, approximately the same time as he joined the Rockland GAA. Years later, he became a booster member of Hibernian House. Emmett is also a member of the Friendly Sons of Saint Patrick, Rockland Chapter. Over the past 22 plus years, Emmett has been involved with numerous benefits to help defray costs for friends in need and on too many occasions to count, Emmett has been available to assist abundant events in the Irish community by sending out email and text notices to hundreds of supporters. Emmett also ran a golf outing every year for Saint Jude’s Children’s Hospital, a charity which he holds near and dear to his heart. As a member of Division 5, Emmett has held the office of Vice-President, has been honored as the Rockland County Aide to the Grand Marshal to New York City Parade, 2004 and was recognized by the Rockland County AOH as their Businessman of the Year in 2013. In addition to being a member of the above-mentioned clubs, Emmett is also a very proud member of Clan Na Gael, which he promptly joined in 1986, shortly after coming over from Ireland. Emmett would like everyone not to forget all the fallen volunteers and all volunteers who have served jail time over the last 100 years fighting for a free and united Ireland. Hopefully, the mission of a United Ireland will be accomplished in our lifetime.